A family run business established for 30 years with an outstanding reputation to withhold in the roofing industry. Based in Walton on Thames, we welcome all types of enquiries from Weybridge, Woking, Byfleet, Guildford, Chertsey, Virginia Water, Sunbury, Kingston Upon Thames, Twickenham and all surrounding areas. 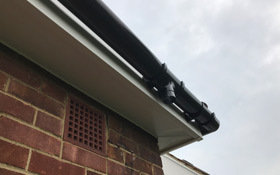 Our highly skilled roofing engineers use both traditional and modern technology roofing methods to get each job completed to the highest standards. All of our work is fully guaranteed and for your peace of mind, we carry public liability insurance of £2m. Our expert roofing services are offered at competitive prices with no obligation at all. A deposit is not required in most cases, and we only accept payment from our customers once they are 100% satisfied with the finished job. 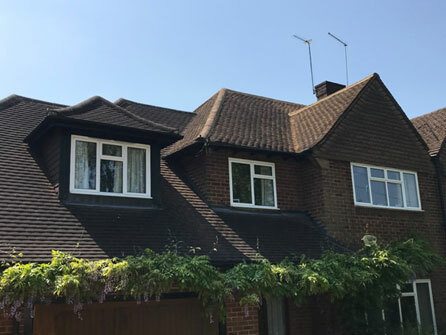 Using only the best quality roofing materials on the market today, our experienced tradesmen put the same attention to detail into all jobs whether it is for a private homeowner or a commercial client. 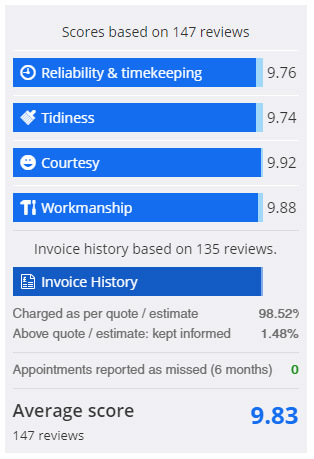 Take a look at our Checkatrade page and see our excellent customer reviews to check what our customers are really saying about our work and decide for yourself. 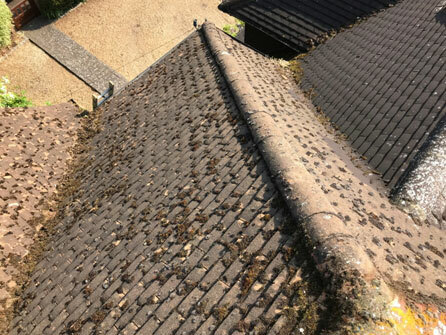 We offer free surveys to assess your roof and inform you on the best plan of action to get your roof safe, secure and watertight. 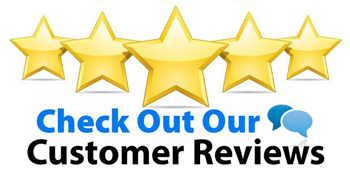 Free quotations and free helpful advice are given as standard. 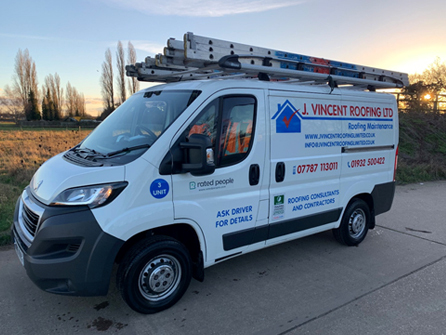 So, give J Vincent Roofing Ltd a call today to discuss your roofing requirements with us today on 01932 500422 , we will be glad to help. 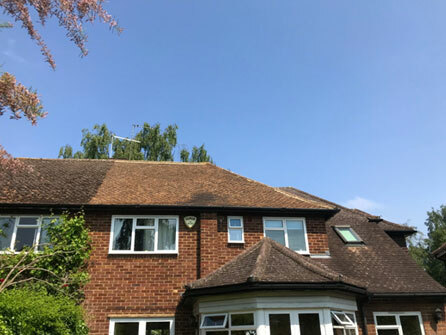 If you wish to have your moss removed from your roof then it is best to get a quote from us NOW. Moss may look pretty on your roof but it is critical to get it removed fast. 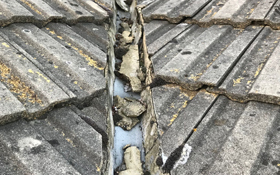 Moss causes untold damage to roofs such as splitting and cracking of tiles but ends up playing havoc with the structure of your roof over time, including big repair bills. 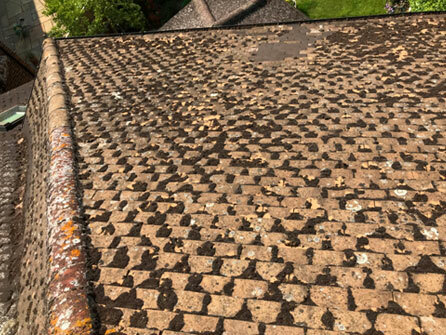 Call our roofing experts to discuss it further, we offer free advice on moss removal for your peace of mind, call us today on 01932 500422 . New Velux roof window fitted. 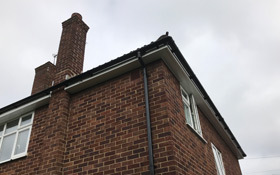 Replacement of rear extension roof. 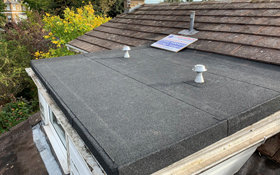 New 3 layer felt flat roof, new boarding and ventilation and installation. Replaced roof valleys and replaced ridge tiles.